Wing part of female of Metacnephia saileri from Peterson (1981, fig. 33) . Wing part of female of Greniera abdita from Peterson (1981, fig. 32) . Wing of female of Mayacnephia from Peterson (1981, fig. 29) . 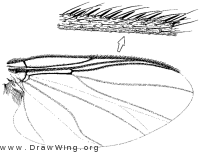 Wing of female of Cnephia dacotensis from Peterson (1981, fig. 27) . Wing of female of Gymnopais holopticus from Peterson (1981, fig. 26) . Wing of male of Parasimulium stonei from Peterson (1981, fig. 25) . Wing of male of Parasimulium (Astoneomyia) melanderi from Peterson (1981, fig. 24) .